it's a bit late notice, but I listed new items on my webshop. 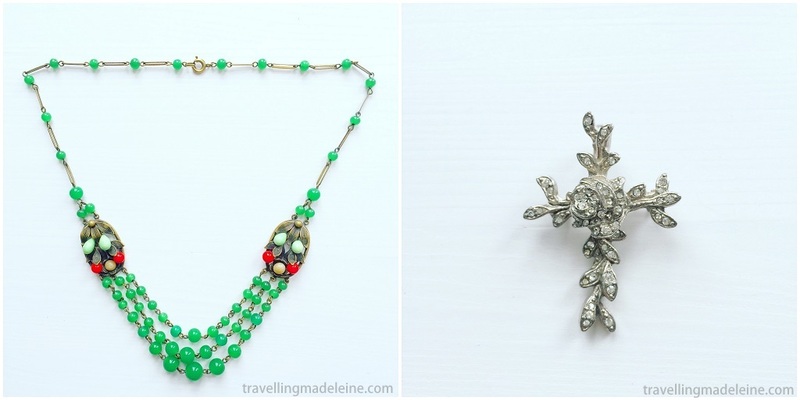 These are very old necklaces specially from Art Deco era. 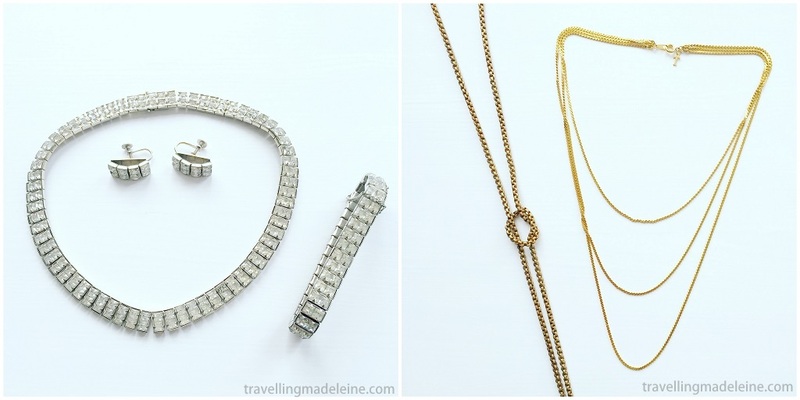 I love the 20's fashion, but I thought Art Deco jewellery tends to have classical design. In fact, I realized there are colourful and pop design in the era too. 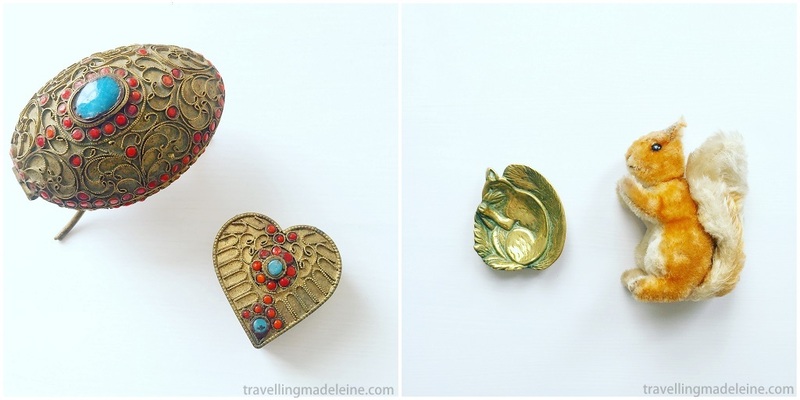 I found so many interesting and cute jewellery from Art Deco. I would love to introduce more beautiful Art Deco jewellery in my shop. The latest collection is rhinestone jewellery. Those clear colour shiny rhinestones are just like cold ice cubes, perfect for this hot summer! So elegant and simple colour, it's usuful for daily and formal. 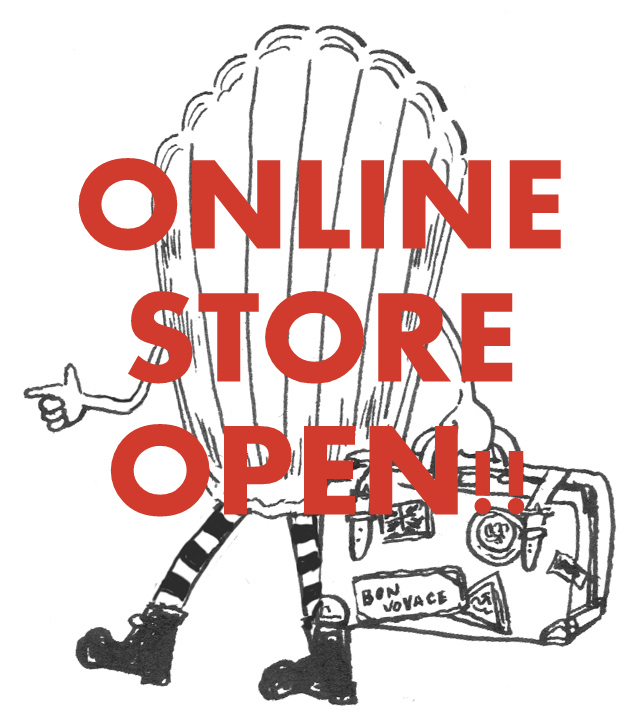 Please check it out for my web shop! For UK customer, I give you special discount, so do not buy from the web shop, please email me. I wish I had 10 days in a week! This London Fashion Snap is a special version from Japan. At Koisuru Marche in May, Osaka, Japan. I was soooooo busy at Koisuru Marche, but I couldn' miss her fashion. How fabulous her fashion is, to have her own style. We can sense that she loves fashion so much. It's already the mid of July, but let me introduce the new arrivals of July!! It's summer, so I have got some seaside vacance motif. 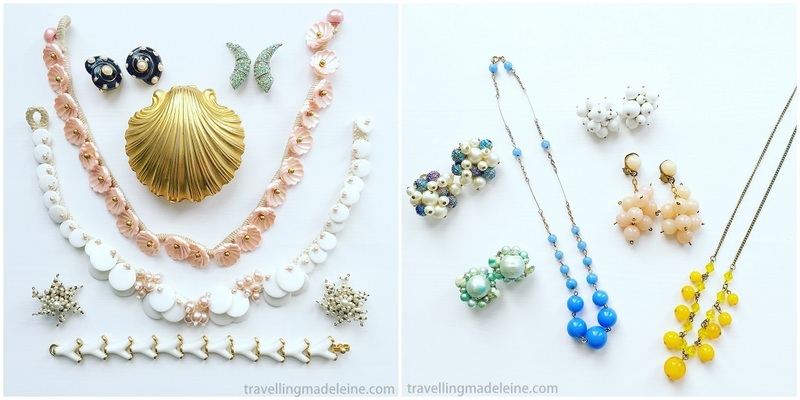 Pink shell and pearl necklaces are like Mermaid princess' jewellery. Seed pearl star earrings are circa 1920's. I have got cute ball glass jewellery a lot, just like the bubbles from sea. The left is from 1930's, vivid green glasses are so beautiful, and cute design. The right one is from Christian Lacroix. Beautiful design and also could use as a pendant top. There are more brands, Trifari's cute items are in. I've got a cute elephant brooch of Trifari, from 1980's. 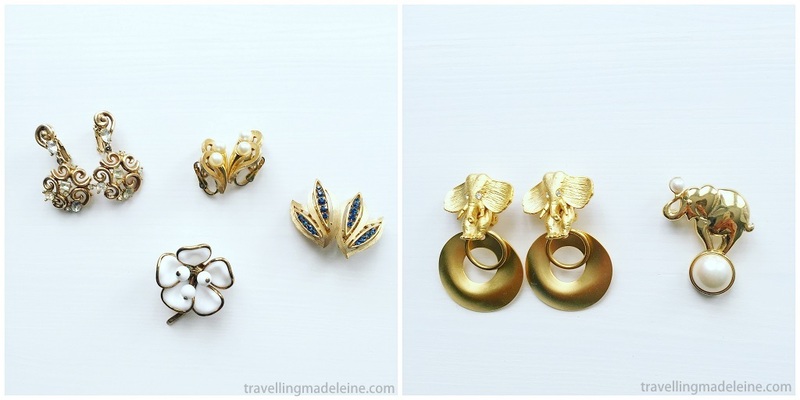 Also, I have got cute elephant earrings from 1980's, from the same supplier. Still love Sun face & Moon face. 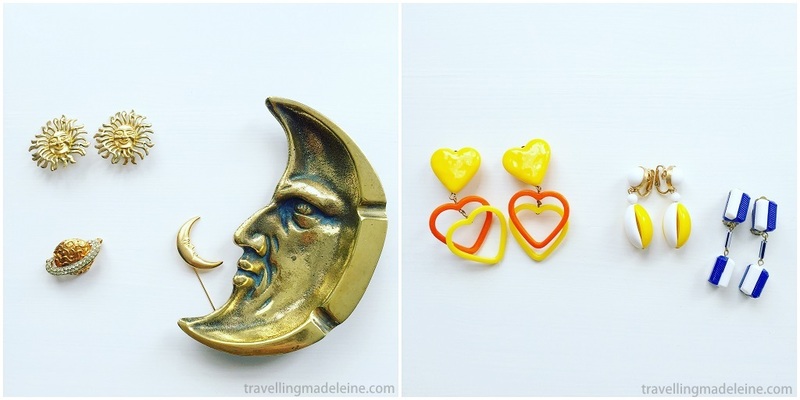 I have got many sun face jewellery, but I have got moon faces this month! Specially, look this moon face ash tray!! Pop jewellery are also in, perfect for summer. They are from almost 100 years ago, but still modern! I have got simple chains, which is very unusual for me. The left chain is from Victorian. Just a simple chain. You can tie like a necktie or choker, we can try various style. The right chain is from Trifari from 1980's. It's triple, but so simple. You can wear it on any style. There are cute homeware too!! 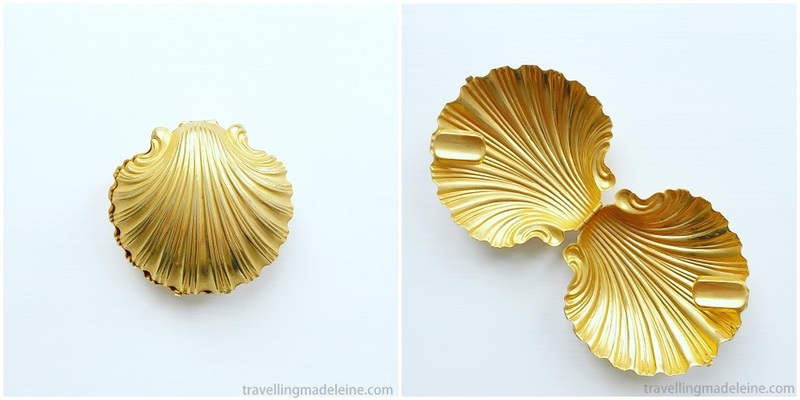 I have found beautiful shell formed portable ashtray. It's from 1950's and beautiful design. You can put a cushion and use as jewellery case. Cute enameled swallow wall deco. Circa 1940-50's. I often find brass ones, but not enameled. Enamel is a bit fragile, but the colour is so beautiful. I love swallows and always looking for swallow motif from French vintage. 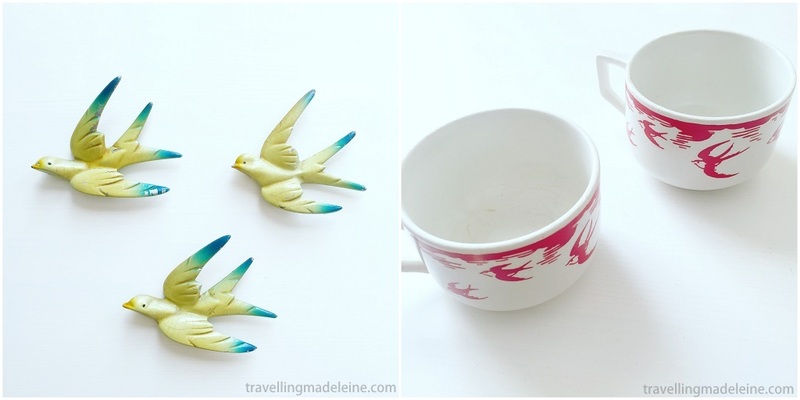 I finally found cute swallow cups from France.... but it's a bit expensive. Circa 1940-50's. Look at the shape of plates!! I have found lovely items perfectly suit the items I showed last month. Heart shaped trinket box is totally same series from the egg shaped ashtray from last month. I have got a new vintage garment too. Very good condition, but quite small.... (XS or XXS). Of course, more items are in this month!! I am going to do Old Spitalfields this Thursday, 19th. It will be confirmed on 18th, please check my SNS account like Instagram. This time, the theme will be Mermaid princess's room.... probably. So I will bring something sea motif, shell, pearl, blue, white, etc. If you are interested in something, please contact me. I am not going to put all items here to online store. However, I can make a deal privately, so please ask me freely.